We offer a wide variety of classes in cities throughout Orange County and parts of Los Angeles and Riverside Counties, designed to help your canine companion become a more enjoyable family member and a better citizen of his community. Our instructors have years of experience training and instructing in their special areas. Each one is committed to the mission of Dog Services Unlimited and Hacienda Hills Obedience Club: to educate and assist people in training their dogs, thereby improving the lives of dogs and their owners and families in Southern California. REGISTRATION IS OPEN NOW IN ALL CITIES FOR SPRING 2019 -- CLASSES START MARCH THROUGH MAY! If you need help establishing good conduct and curbing bad habits such as destructive chewing, hole digging and over- exuberance, enroll Rover now! All breeds of dogs (6 months or older) may join.this 7-week class Larger breeds may be accepted at 4 months. All basic obedience commands including Heel, Automatic Sit, Sit-Stay, Down-Stay, Stand for Inspection, Recall (Come!) will be covered, as well as introduction to long-distance and off-leash work. Trophies and certificates will be awarded at graduation. Start meeting your training goals and changing your dog's problem behaviors in just four weeks in this fast-paced obedience course! You will experience four 75-minute lessons of intensive instruction and practice, designed for people who need to accomplish their training goals and get behavior problems under control within a limited time. This course covers essential obedience commands (Heel, Sit, Down, Stay, Come), and offers discussion and question-and-answer opportunities to help you correct behavior problems such as chewing, digging, "counter-surfing" and jumping on people. Continue your canine's education! 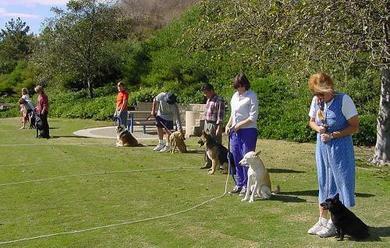 We offer a 5-week obedience course for dogs that have completed a basic Dog Obedience class. Our "post-graduate" class provides handlers and dogs with the opportunity to continue improving and reinforcing basic obedience exercises in a group setting, and also introduce new skills and exercises. Long-distance stays, recalls from 30 ft., hand signal work, and continuing exposure to different distractions are mainstays of this class. Students may progress to off-leash training as their skills improve, as well as other advanced exercises such as Drop on Recall, and Sit-Stay and Down-Stay out of sight. Handlers preparing for obedience competitions, pet therapy programs, or "Canine Good Citizen" certification will find this class extremely helpful. Start your new puppy out on the right paw! Establish good manners and valuable socialization skills at an early age for puppies 2 to 5 months. Class will include puppy care topics such as housebreaking, teething problems, healthcare pointers and basic obedience commands. Puppy certificates will be presented at the last class. All mixed breeds and purebred dogs who have had obedience training or are currently enrolled in a training class are welcome to try to earn their Canine Good Citizen ® or CGC™ Certificate in this 1-meeting testing program. Your dog will be tested on ten skills outlined in the American Kennel Club Canine Good Citizen ® Program. These skills demonstrate his responses to basic obedience commands, and indicate whether he will behave in a well-mannered way when out in public and in the midst of distractions. Students who pass all ten parts of the test will receive the paperwork needed to obtain their official certificate from the American Kennel Club. Passing this test will also entitle a dog registered with the AKC to add the CGC™ TITLE to her AKC record!